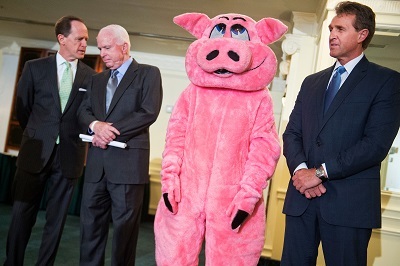 WASHINGTON – When it comes to earmarks, one man’s pig stink is another man’s bacon. No kidding. The massive, $410 billion spending bill that will pay for the federal government until Oct. 1 contains 8,500-plus earmarks, according to a study by Taxpayers for Common Sense. Critics say the earmarks – projects added by members of Congress — are rank examples of pork-barrel spending. But the lawmakers contend they’re just doing their jobs, which includes bringing home the bacon to their constituents. Iowa Democratic Sen. Tom Harkin went to the Senate floor to defend one of his earmarks — $1.8 million to research swine odor and manure management in Ames, Iowa. Earmark foe Oklahoma Republican Sen. Tom Coburn had sponsored an amendment to delete that earmark and others. Harkin insisted he was proud of his earmark. “Keep in mind, this is not wasteful or unnecessary or frivolous,” he said. Harkin explained that Iowa, with 20 million hogs, has struggled with hog odor and waste management. And, the problem isn’t confined to Iowa. As agriculture committee chairman, Harkin said, he has witnessed the same issues in North Carolina. Research on how to manage hog odor and waste is no laughing matter, he said. Earmarks, though, are great fun to pass judgment on because they are, by nature, parochial. And the dollars do add up. Earmarks in the so-called Omnibus appropriations bill totaled $7.7 billion. Even though that was less than 2 percent of the overall spending, such pet projects smell sweet only to the people getting the money. Taxpayers, already burdened, hate to see their money squandered. On the other hand, when members of Congress go home, their constituents are grateful for the new water treatment plant, downtown revitalization project or convention center. People believe the projects in their backyard are worthy and necessary. It’s those others that are porky. Plus, there’s a whiff of old-fashioned political hypocrisy around earmarks. Sen. John McCain, R-Ariz., lambasted President Barack Obama for failing to fight this year’s pet projects after promising in the campaign to eliminate earmarks. The White House, though, heard from Capitol Hill to keep its hands off the spending projects, which were put in appropriations bills during the Bush administration. With other irons in the fire, the White House punted. Obama is expected to sign the bill, earmarks and all. It doesn’t look good, though, for the president who vowed to change business as usual that his chief of staff, Rahm Emanuel, formerly a representative from Illinois, and Obama himself had earmarks in the bill. Obama did keep earmarks out of the stimulus package, but critics of the $787 billion package complain it’s larded up, too. Critics want a return to the traditional process in which projects are first authorized by Congress after hearings and then face a separate appropriations process. Earmarks bypass the oversight. In the Harkin example, though, the Agriculture Department, which administers the research lab, requested the money, he said. 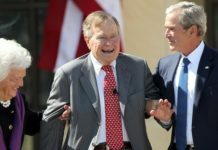 The final Bush budget deleted it, along with several other research projects, to save money, knowing, Harkin said, that Congress would restore it. “This is very important to the daily lives of the people of my state and every other place where we raise swine,” Harkin said. Coburn shot back that he knows exactly how bad hogs smell. “I have traveled every farm area in my state. As a matter of fact, to me a lot of it smells pretty good compared to what you smell in cities,” Coburn said. The Senate rejected Coburn’s sniff test and his amendment. Only 34 senators voted to kill the pig odor and manure earmark. It was no joke.